My name is Alex Kamsteeg and I live in The Netherlands. 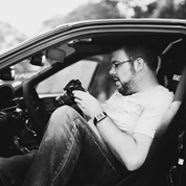 I write code, both as a hobby & as a fulltime job, and I love to photograph, work on and drive cars. You can contact me through a message on Twitter. My main interests are software architecture, code quality, performance, usability and security. Most of my code is written in C#, but of course I can write code in a few other languages too. Some of the things I write in my spare time are on Github, like this site, and few old projects are lingering on Sourceforge. A few of my projects are also available as NuGet packages. Currently I work for CycloMedia, a leading player in GIS imagery, as a software engineer. In the past I worked for six years at The Competence Group, as a developer on their online e-learning platform. At Avans Hogeschool I studied Software Engineering from 2006 until I graduated as a Bachelor of ICT in 2009. My final internship was at Colours, one of the biggest full service webdesign agencies in The Netherlands. As a hobby I photograph cars, races and other car-related events. I publish those pictures on a site dedicated to my photography. You can also view them on my Flickr. With a few friends I run the site Wangan Warriors, a community dedicated to Japanese-made cars. I write and shoot for the weblog and Facebook page. Why AtleX? Alex → @lex → AtleX. Just blame the mixed upper- and lowercase rage of 2003.